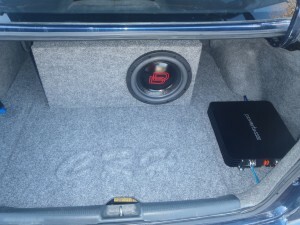 The owner of this 2001 Civic wanted two things out of this install. First, they wanted to use the matching full-size spare. Second, they wanted to be loud and noticed. 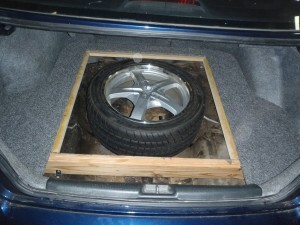 We built a false floor to accommodate the full size spare and with a removable cover to access the tire. We put in a Digital Designs DD 1510D2 (10 Sub) loaded in one of our hand crafted boxes. 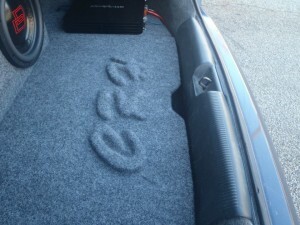 It is powered by a Power Bass ASA 600.1Dx (600 Watt Class D Amp). 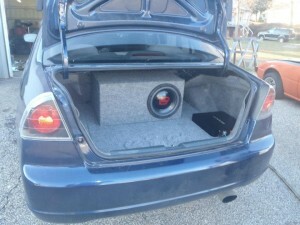 The customer said “Most are seriously confused to see it’s a single 10″ that sounds like 2-12’s”.